The U.S. Energy Information Administration recently released data from its Nuclear Fuel Data Survey on the amount, type, and characteristics of spent nuclear fuel once it is discharged from a reactor. 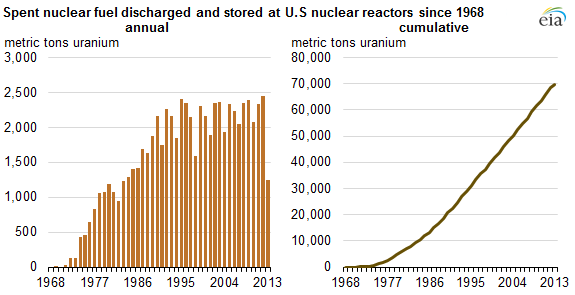 As nuclear electricity generation has continued to increase, the inventory of discharged spent fuel from nuclear reactors has grown steadily since the 1970s. The latest Nuclear Fuel Data Survey data show that a total of 241,468 fuel assemblies, with an initial loading weight of about 70,000 metric tons of uranium (MTU), were discharged from and stored at 118 commercial nuclear reactors operating in the United States from 1968 through June 2013. Illinois, Pennsylvania, and South Carolina have the highest amount of stored nuclear material, with more than 4,000 MTU in each state. Nuclear reactors are fueled by fissionable material, most commonly uranium, that has been enriched and formed into fuel rods. These rods are bundled together to form fuel assemblies, which are loaded into the reactor core and irradiated. These assemblies are used in the reactors for multiple cycles, with each cycle typically lasting between 18 and 24 months. After being irradiated, the spent fuel assemblies are highly radioactive and must be properly stored. There are two storage methods used for spent fuel: spent fuel pools and dry cask storage. The spent-fuel-pool approach involves storing spent fuel assemblies in large pools of water that cool the assemblies and provideshielding from the radiation. Dry cask storage allows spent fuel already cooled in a spent fuel pool for several years to be stored inside a container, called a cask, filled with inert gas. Each cask is surrounded by steel, concrete, or other material to provide shielding from radiation. All spent fuel storage is regulated by the U.S. Nuclear Regulatory Commission. Approximately two-thirds of total spent nuclear fuel is from pressurized-water reactors, and about one-third is fromboiling-water reactors. 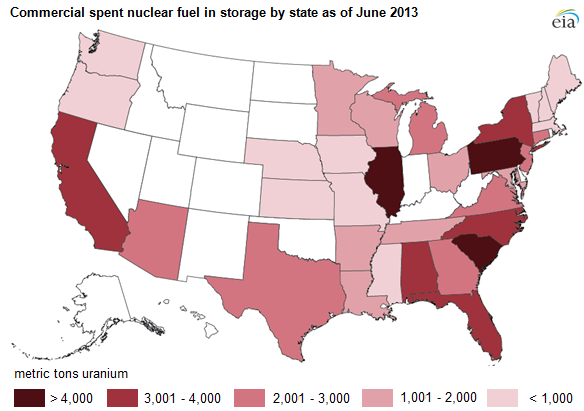 In the United States, nearly all spent nuclear fuel is currently stored on-site at commercial nuclear power plants. A very small amount, less than 1%, has been shipped to away-from-reactor, off-site facilities.